This Meaty Vegetarian Salsbury Steak Meatloaf, or meatballs is the perfect addition to your holiday meal, whether it’s Christmas, Thanksgiving, Easter or any day really, this delicious & easy vegan seitan steak recipe has it going on. I mean come on! Who doesn’t like Thanksgiving Vegan Meatloaf with gravy, YUM! Add the onion and oil to large skillet, on medium heat, saute for 7 minutes or so till golden brown. Add the garlic, pinch of salt and pepper & cook for minute or two longer. add to small bowl, set aside. * IF AVOIDING OIL use a non stick pan and saute onions and garlic in a little water or veg stock till cooked. Next process mushrooms in food processor, in two batches, scraping down sides if necessary, till quite small, slightly mushy, but with some texture remaining. Add to large glass mixing bowl. Next add your lentils to food processor with onion garlic mixture, pulse a few times. You want the lentils to retain some texture. Add rest of ingredients to bowl except gluten flour and mix well. I usually taste the mix at this point, don’t worry if it seems a little salty, once the gluten is added it’s perfect. Now add your Vital Wheat Gluten and mix for 2 to 4 minutes, ( I usually do this by hand, like mixing dough) till you see strands forming in the gluten. The strands are what holds your veggie loaf together.The mixture will be moist not dry, but will not stick to your hands. 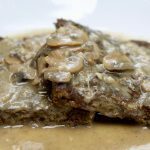 Slice and enjoy with mushroom gravy! Add onions, sliced mushrooms and oil to same skillet , set to medium heat, saute for 5-7 minutes or so, till onions are browning and soft and mushrooms are cooked, then add garlic and pinch of salt & pepper . Cook for another minute, transfer half the mixture to small bowl, set aside. If *AVOIDING OIL saute in a non stick pan with a little water or veggie stock. Add the spices and flour stir for a minute, then add rest of ingredients to pan( except mushrooms/onions you set aside earlier). whisk till all flour is incorporated. Bring to a boil, reduce to a simmer for couple minutes till gravy has thickened. Add gravy to blender and process till smooth. Return gravy to pan and add mushroom, garlic mixture, reheat if necessary. Enjoy with your Vegan Salsbury Steak!! The nutritional chart below was calculated without Vital wheat Gluten and liquid smoke.